The movie Back to the Future II offered a glimpse of what to expect in the year 2015. At the time of production in 1989, notions such as the Chicago Cubs winning the World Series and self lacing sneakers seemed outright impossible. However, one of those impossible notions has come to fruition one full year ahead of schedule. The movie is set in October 2015 and Marty McFly is seen cruising along on a pink skateboard that hovers and is appropriately named the “Hoverboard”. He uses it to escape the clutches of his rival Biff and is able to pull off some pretty amazing maneuvers on it such as hovering on the board while holding on to the back of a truck. In addition to the plastic replica offered by Mattel, there have been numerous attempts to create a working version of this technology. 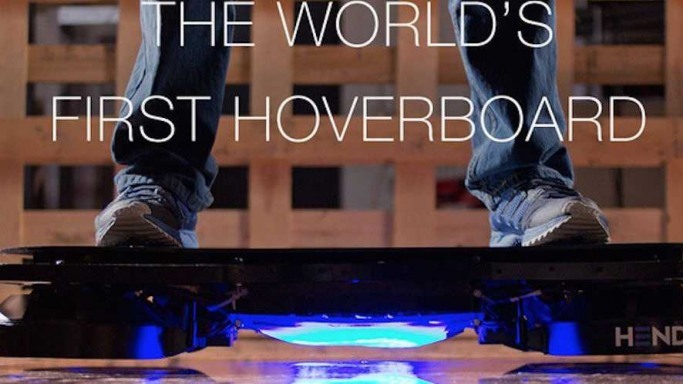 Finally, thanks to a company called Arx Pax, you can own a working version of the hoverboard. Arx Pax is calling their product the Hendo, and it can levitate 3 centimeters off the ground for approximately 15 minutes with a 140kg load. One major drawback is that the Hendo has no form of self propulsion meaning that it requires a push in the appropriate direction from a hard surface such as a wall or the floor. However, the Hendo can be slightly motioned in one particular direction or can be spun around in circles by using touch sensitive plates under the footing. Stepping on the board creates a slight bounce from your body weight followed by a gentle spring as you are lifted back up into the air. The Hendo works by using strong magnetic fields to repel itself away from floors made out of non-ferrous metals such as aluminum, lead, nickel, copper, and a variety of other metals. The Japanese train Shinkansen (“Bullet train”) works in a similar fashion. The Hendo contains four disc shaped engine housings which emit the magnetic fields that are used to push it away from surfaces. The unit also has numerous safeguards in place such as automatic power down and interference free ride surface. This is the company’s 18th attempt at such technology and Arx Pax states that they are making advancements week after week and perfecting such technology will take a time. Arx Pax started working on such technology approximately 2 years ago in which they discovered a way to transmit electromagnetic technology in a very efficient way. This technology is useful in a variety of other ways and could include moving warehouse loads around without any friction. A small “whitebox” developer kit version of this technology is available so that developers can experience it first- hand. The kit is designed to be taken apart, explored, analyzed, and more. Arx Pax claims that they have proven that the impossible is possible. You can own your very own piece of the impossible for $10,000.00 and the Hendo is currently available for pre-order. The company also offers a non-working replica version and is currently working on a plan to create a “hoverpark” which will offer individuals a place to come and enjoy their board.